We are a chiropractic office serving the Salem metro area. Dr. Daniel O. Cook has been a practicing chiropractor for over a decade and has successfully treated literally thousands of automobile and work accident patients. With conditions ranging from whiplash to carpal tunnel, herniated discs, lifting injuries and chronic headaches, our treatments are both specialized and comprehensive. Our office has had remarkable success treating these conditions and is respected as a top work injury chiropractor in Salem, Oregon. 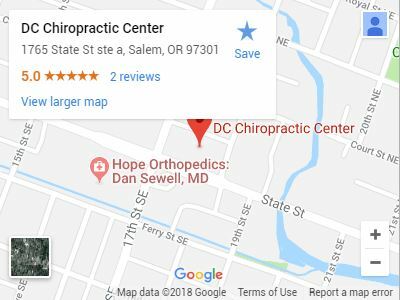 DC Chiropractic Center is one of the few chiropractors in Salem to focus specifically on work injury rehabilitation. Did you know that there are nearly 300 chiropractors in the Salem area? Chiropractors specialize in diagnosing and treating many different musculoskeletal conditions. Some chiropractors focus on wellness, others focus on pediatrics, and others focus entirely on sports rehab or automobile accident injuries. Work injury treatment is best treated with an early diagnosis and proper techniques to get you healthy and back to work as quickly as possible. DC Chiropractic understands that getting injured at work is frustrating and painful. Not only the injury itself but the financial stress and hardships that coincide with the injury. The first step is to report the incident to your employer as soon as possible and make an accurate documentation of the incident. If you need to seek treatment, ask your employer if they have a specific protocol for dealing with your particular incident. Do you need to see an occupational health doctor that your employer recommends? Also look into whether your state worker’s compensation regulation allows you to see your own physician. If you need to seek medical advice, receive treatment for the condition, or have to be out of work; make sure that your employer begins the process of submitting the claim and acquiring a claim number with the employer’s Worker’s Compensation insurance provider. You will need this in order to obtain financial reimbursement or coverage for any medical or rehabilitation services. Salem Chiropractor, Dr. Cook, and his staff have years of experience treating patients who have sustained work injuries and offer work injury treatment that optimizes the healing ability of the body. Treatment Techniques include spinal manipulation, massage, ultrasound, therapeutic exercise, cold laser therapy, IFC Therapy and the application of hot and cold therapy. We go above and beyond for our patients. It’s our job. That’s why Dr. Cook also works with medical doctors and physical therapists to optimize a patient’s treatment plan if chiropractic care needs to be supplemented by other medical treatments. To help decrease pain and prevent long-term degenerative changes associated with a work injury, we encourage you to set up a consultation with our chiropractor, Dr. Daniel O. Cook, DC. Use our online appointment form or call our office in Downtown Salem today.